On Friday I was standing in the parking lot talking to a coworker. Suddenly I realized that I had left my cell phone sitting on my desk inside. Being a runner, or so I tell people, I tried to jog into the building to grab my phone and then jog back to continue talking to my coworker. Can you believe that as I jogged to the door I could feel both of my calves wanting to cramp and pull? I'm serious. What kind of runner can't even jog across a parking lot without a major injury?? I have a neighbor who for reasons which are hard to explain decided to spray the bushes and trees on the south side of my lawn with poison. The resulting damage to the tree nearly killed it. All the leaves curled up and died. Then bore worms drilled into the tree starting at the top and began literally sucking the life out of it, rapidly working their way down the trunk towards the roots. 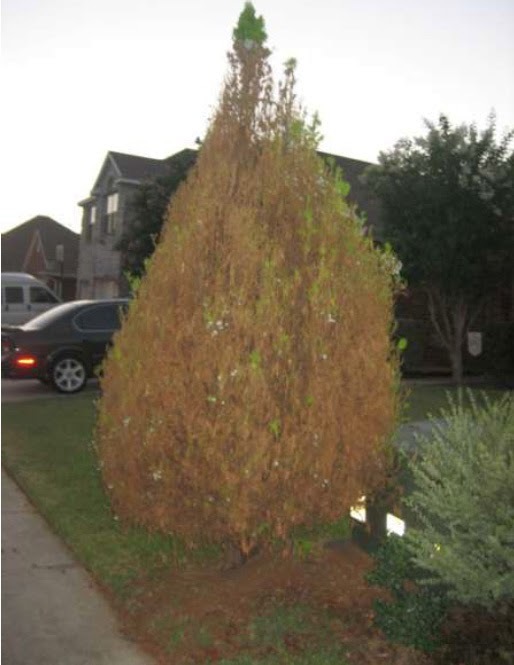 I dumped a can of fertilizer at the base of the tree, ground up aspirin and dumped it at the base, and then hosed the tree with insecticide to try to kill the borers. I finally had to hack the top off the tree, leaving a big stump and a few straggled branches alive, just to stop those boring futhermuckers from devouring the entire tree. So far it has survived, but just barely. Near the tree is an evergreen bush. I hadn't noticed any problems with the bush until just this week. It steadily turned brown all the way around, starting at the back and working around the bush to the front. By the time I went to investigate what was happening to the bush it had become infested with the most bagworms that I have ever seen. There are so many bagworms on this bush that they have knocked each other off the branches, leaving piles of bagworms on the ground deep enough that I could shovel them up if I were so inclined. I bought a giant bottle of Sevin and hosed that sucker until the bagworms were forced to put on swim trunks and snorkels. I did this 3 nights in a row after work. Then I noticed that the 'burning bushes' in front of my house were all dead looking. I don't think my neighbor did this one. These stupid bushes have done this 2 years in a row. I can't remember what I had to do last year to save them, so already having the bottle of Sevin on the hose, I soaked them with it. THEN I examined them. This neighborhood has some sort of fungus curse. I don't know what the deal is, but when I moved in every plant had this nasty gray fungus killing absolutely everything. I had to drown all plants with fungicide just to save them. That was years ago. When I examined the Burning Bushes I saw that stupid fungus on them again. So I mixed up and fungicide and sprayed them down top to bottom. I know what you're thinking right now. Yes, this has got to be the most boring post I have ever written. Patience! It was 7 pm when I went outside to do all these things. The sun was setting already. It was 87 degrees outside. I swear the humidity must be 150%, maybe 200%. Sure, that's technically not possible. But the instant I set foot outside my house I was pouring sweat. And I was already sweating just walking around inside my house while I debated whether to go outside and deal with this crap. Its ridiculous! So ... yes, I'm starting a sentence with 'so' .... so after all this poisoning and sweating and cursing I finally came inside the house to shower. My t-shirt was a disaster of sweat, so I threw it into the sink and turned on the faucet to presoak it. I had to start doing this after two of my t-shirts actually molded while sitting in the laundry waiting to be washed because they were so wet with sweat. No, I'm totally serious. You think you know humidity? We got your humidity right here, bucko! So I threw my t-shirt into the sink, stoppered it, and turned on the faucet to presoak it. Then I jumped into the shower. After showering I turned off the water and stood in the shower drying off. But I could still hear water running. I stood there looking around, worrying that I might have a plumbing issue to deal with on top of everything else. Finally I stepped out of the shower. The faucet at the sink was still running. And the sink, being one of those modern shell-shaped artsy-fartsy things, has no emergency drain hole near the top and so had filled completely up and was overflowing into the floor. 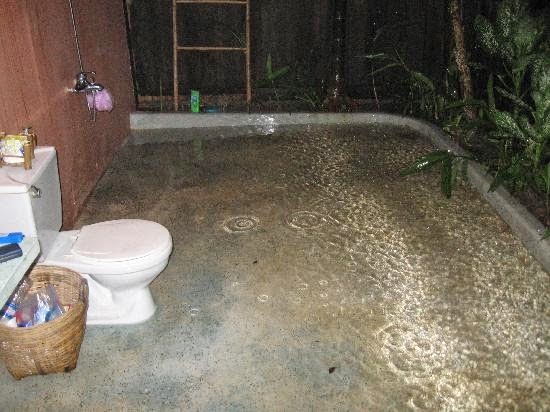 The bathroom floor was a swimming pool! I swam over to the sink and turned off the faucet. Then I started throwing towels frantically onto the floor to soak it up. I ran out of towels pretty quickly, even throwing the towel I had been drying off with into the ocean of sink puke. And then I opened the bathroom door. The hallway was a lake. I swam across to the linen closet and started yanking out towels, throwing them into the pond that was once my faux hardwood floor. Oh, speaking of faux hardwood floors, do you know what happens to laminated cardboard faux hardwood floors when they get soaked like this? Yeah, they ruin. So I was in a panic. About this time, my wife came home. She found me standing in a pool in the hallway, towels everywhere, and me stark naked and still dripping wet. I can't believe this isn't a Monday. It sure feels like a Monday. It couldn't have been a much worse day. 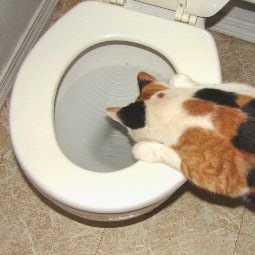 Oh, and my cat has a bladder infection and keeps peeing and peeing and peeing. And the vet can't see her until Friday. So there's THAT. a not warmed up runner is the one who can't jog across the parking lot without an injury LOL! Sounds like you have a major bug/gardening issue going on. As I don't garden I really have no idea about that one!! Whoops - so you left the tap running & flooded the place??. Oh dear!!! Hope you've finished washing all the mop up towels. Hope your week has gotten better!!!!!!! AlleyCat, that would be me, then. My calves are super stiff after all my runs lately. Even the day after. The bug issue happened because my beer swigging neighbor hosed my plants down with lawn weed killer and nearly killed them. The insects responded to the weakened plants by swarming them. I grew up in a house with sinks that had emergency drain holes underneath the rim of the top of the sink so that an overflow can't happen. The newer, more fashionable sinks lack these, as I discovered through trial and soggy error. Blah! The vet says she has the worst raging UTI ever. She's been injected with a double dose and now we're having to give her a dose of medicine every night until it clears up. She's miserable. Pooping right next to the litterbox is SO frustrating! When the box is clean and waiting to go I just don't understand it. awww hope you kitty is feeling better soon!!! !